In the last year we've seen more demands for SAP system refreshes due to upgrade cycles and/or migrations to new platforms (including cloud, OS and DB). SAP Basis teams are stretched thin between project needs for DB refreshes. While there have been improvements for cloud, virtualization, storage technology, and vendor tools for system copy, the basic issue is still performing post-copy technical configuration in the refreshed system. Tools such as SAP LaMa (Landscape Management), which is the new name for SAP LVM (SAP Landscape Virtualization Manager), are costly and requires yet another SAP installation. IT-Conductor has maintained the elegant, efficient and affordable subscription solution for your post-copy automation needs. Yes. This is for expert, customer understands and takes responsibilities for tables they specified. Basis Table Cleanup: Can some Basis configuration tables be cleaned up? Below is a list of ‘technical data and configuration’ that may be exported/imported using SID-Refresh. Note that selected options are saved on initial use, and can be reused on subsequent execution of the refresh. 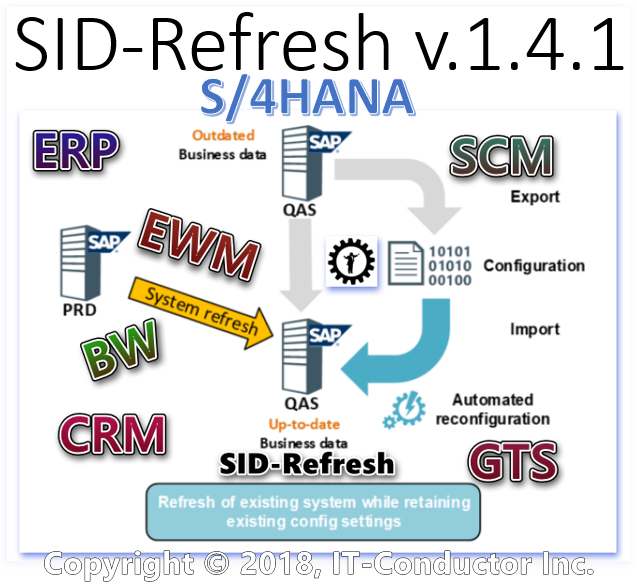 We are planning to integrate SID-Refresh into IT-Conductor cloud monitoring and automation platform to enhance flexibility of configuration, monitoring of source and target systems as well as the refresh process, centralized control of the refresh process including tasks that would traditionally be done for OS and DB, such as BDLS for logical system changes.